Nestled within the Brandywine Valley of Pennsylvania, Longwood Gardens is one the great gardens of the world. Natural beauty, native woodlands, world-renowned conservatory, plus year-round performances and educational opportunities offers something for everyone, every month of the year. 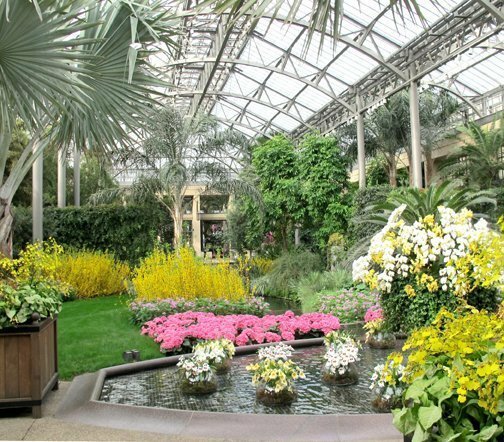 Longwood Gardens today exists from the humble beginnings of the Pierce family back in 1700. Their original 402-acre tract of land was purchased from William Penn’s land commissioner in the unsettled township of East Marlborough, Pennsylvania. 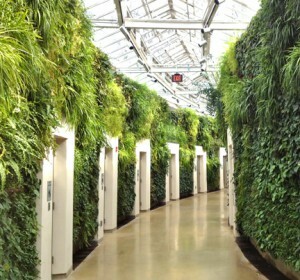 Today, that parcel and more make up the 1,050 acres of Longwood Gardens in Kennett Square, PA. In 1906 Pierre S. du Pont (1870-1954) learned that the magnificent trees at Pierce’s Park were to be cut for lumber. Always having an interest in horticulture and design, du Pont bought the land and the lumber contract in time to save most of the trees. The property dubbed, Longwood Gardens, became the life long interest of Pierre S. du Pont, whose legacy lives on today through Longwood’s garden design, horticulture, education, and the arts. Visiting Longwood gardens, the conservatory is always a highlight no matter what time of year. Under glass, there are 4.5 acres of paradise for the plant enthusiast. In 2010 a grand new entrance to welcome guests into the conservatory was built and features 17 restroom facilities called comfort stations. 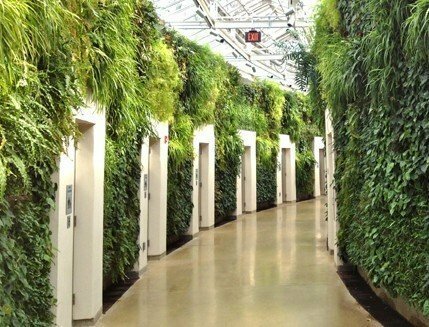 A green wall covering more than 4,000 square feet encases the entrance to each comfort station. 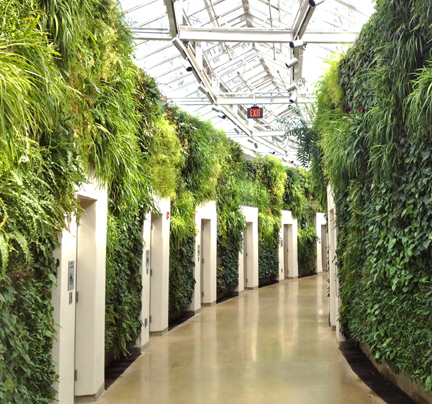 A hallway of lush foilage takes vertical gardening to new heights. A simple design with natural patterns replicating what one might see in native woodlands. Longwood Gardens are only a 7-hour drive away from the Triangle, and worth a visit every season of the year. During a recent visit of Longwood Gardens with friends, we met up with Dr. Robert Lyons, former director of the JC Raulston Arboretum from 1998 to 2004. We were greeted with a hearty hello and a private tour of the Gardens. 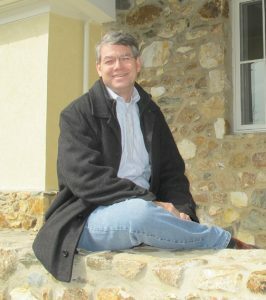 Today, Bob is the program director and professor overseeing the professional development and research projects of the students in the Longwood Graduate Program in Public Horticulture. While visiting Longwood Gardens, be sure to check out The GardenShop, where you will find Longwood signature items, apparel and toys, as well as plants. Grab a bite at Café for fresh local salads, soups, sandwiches, hot entrees, pastries, and children’s meals. Or go formal with a full-service dining experience in “1906” — the dining room named in honor of the year Mr. du Pont purchased Longwood from the Pierce family. Tickets can be purchased on-line, in person, or by calling 610-388-1000. Additional fees apply for phone orders. The Philadelphia region is internationally recognized for its wealth of arboretums. Chestnut Hill’s Morris Arboretum of the University of Pennsylvania is the official arboretum of Pennsylvania and boasts the only fernery in North America. For more information about travel to Philadelphia, check out visitphilly.com. Helen Yoest, owner of Gardening With Confidence™, is working on her first book to be released later in 2012. Catch up with Helen on her blog at www.gardeningwithconfidence.com.